The ambitions, hopes and aspirations left unfulfilled by these women’s early demise are brought to the surface, and the frustrations of each are keenly felt. The play flows smoothly as each wife enters and adds yet another dynamic into the mix. The confrontations build, and at each turn new layers of pain and frustration are revealed. But Ladies manages to do this in such a way that you’re not overburdened or annoyed at these women complaining about the same man. This is because jokes and comic relief are timed well so that you never get dragged down into a pit of their anger. In a show that features five strong and dynamic women, an actress better be able to hold her worth. 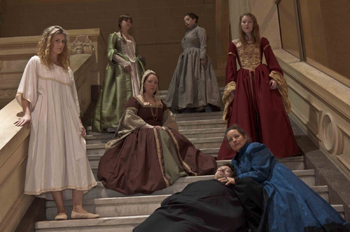 Katherine of Aragon, played by Jan Kudelka, is dynamic. Catherine Howard, played by Norah Smith, is just so endearing if a touch one dimensional. And Anne Boleyn, played by Lise Maher, is just as you would expect her to be, which is to say strong and unapologetic in her motivations and ambitions. In such a strong cast, Blanche O’Sullivan, does get swallowed up at times but still performs well as Jane Seymour. Finally, Nadene Schuster, as Anne of Cleves, is charming and smart. I think the main criticism I would give is that the whole play is a bit of an inside joke. If you don’t know much about the wives of King Henry VIII, you won’t get a lot of the subtext, nuances, and importance of many of the shows lines. This is more of a play for fans. Someone like myself, who has read and watched almost everything about King Henry VIII and his wives, will really enjoy this as many obscure tidbits or history will be mentioned and it’ll make you laugh. But if you don’t know much, if anything, about his wives and their history, I’m afraid that a lot of it will go straight over your head. As mentioned at the beginning, this play is about the women. It builds to discuss what’s really at the heart of the matter. What is really important enough for them all to be here at the moment of his death. But to each one, the heart is different. Some want validation that their pain was worth it, some want validation that they did their duty, and some want validation of love. Do they get what they want? Well, that would be a spoiler wouldn’t it? Ladies-in-Waiting plays at Venue 10 – Theatre Passe Muraille Mainspace, 16 Ryerson Ave (North of Queen St., East of Bathurst). Playing July 04 07:00 PM, July 06 01:45 PM, July 07 05:45 PM, July 10 10:45 PM, July 12 05:15 PM, July 13 08:00 PM, July 14 12:00 PM. Photo of Blanche O’Sullivan, Nadene Schuster, Norah Smith, Anna Kay, Eldridge, Lise Maher, Jan Kudelka, James Baldwin by Trent Scherer. I just wanted to say that I knew next to nothing about the wives of Henry VIII going into this show, and I LOVED it! I don’t think it’s all inside jokes. You end up learning a lot about the wives just by watching. And the younger character asks questions of the others so that you get some background through her. This was an outstanding production — both the writing and the acting, so I encourage anyone to see it!